It includes a mobile device friendly responsive design to enable cross device viewing. The initiative provides comprehensive information for current clients while reaching potential new clients with an enhanced Internet presence. The new website was designed and developed by R & R Web Design LLC, a Michigan web design company that has been serving valued clients since 2000 with results driven Internet solutions. Michigan Santa Claus LLC offers the unique opportunity for you to invite an authentic-looking, real bearded Santa Claus and his wife to your next holiday event. Serving the Detroit metropolitan area and lower Michigan, this singing Santa Claus is a gifted actor with a rich baritone voice. Mrs. Claus is also an experienced vocalist and actress. The singing duo will definitely delight your little ones and put the twinkle of the magic of the season back in your eyes. 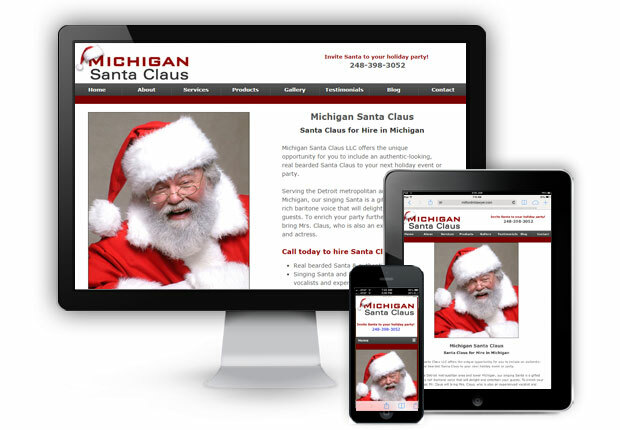 To learn more about Michigan Santa Claus LLC, please visit the new website in at www.michigansantaclausllc.com or call 248-398-3052. You may also contact them through their website at: Michigan Santa Claus LLC. Congratulations on the new website! I’m looking to hearing more about your wonderful adventures!